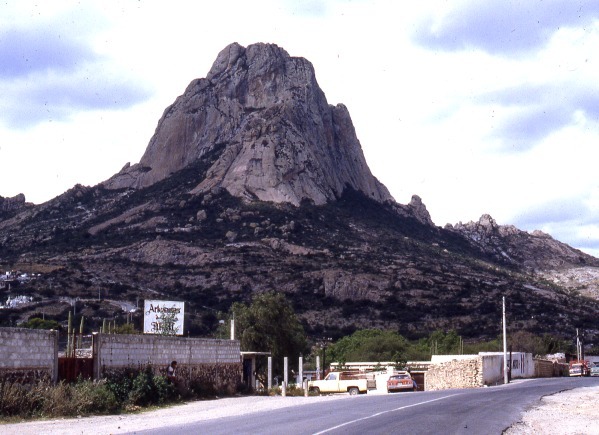 The Peña de Bernal, in the central state of Querétaro, is one of Mexico’s most distinctive geomorphosites. Geomorphosites are “landforms that have acquired a scientific, cultural/historical, aesthetic and/or social/economic value due to human perception or exploitation” (Panizza M., 2001). See Geotourism and geomorphosites in Mexico for a brief introduction to the topic. The Peña de Bernal is a dramatic sight, which only gets more imposing the closer you get. How high is the Peña de Bernal? We are unable to give you a definitive answer (it depends where you start measuring from) but claims of 350 meters (1150 feet) sound about right, assuming we start from the town. The Peña de Bernal. Photo: Tony Burton; all rights reserved. According to its Wikipedia entry, this is the “third tallest monolith in the world”, apparently only exceeded by the Rock of Gibralter and Sugarloaf Mountain in Rio de Janeiro. Others, including Melville King, have described it as the “third largest rock in the world”. These claims may (or may not) be exaggerated, but in reality it is definitely a very steep and tiring climb, even to reach the small chapel that has been built half-way up! The photo below is taken from this chapel, looking out over Bernal and the local farmland and vineyards. View from the Peña de Bernal over the small town of Bernal. Photo: Tony Burton; all rights reserved. How was the Peña de Bernal formed? The most likely explanation is that this monolith represents the hardened magma (molten rock) from the central vent of a former volcano. This rock was much more resistant to erosion that the layers of ash and/or lava that formed the volcano’s flanks. Centuries of erosion removed the sides, leaving the resistant core of the volcano exposed as a volcanic neck. We will examine this idea in slightly more detail in a future post. At the Spring Equinox (March 21), the town is invaded by visitors “dressed in long, white robes or gowns, and red neckerchiefs” who come seeking “wisdom, unity, energy and new beginnings”. (Loretta Scott Miller writing in El Ojo del Lago, July 1997). 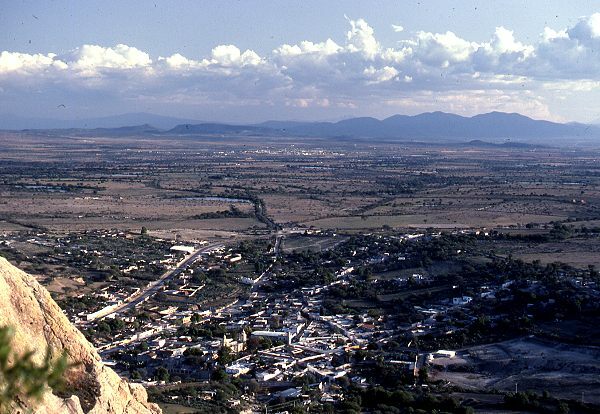 From Mexico City, take the Querétaro highway (Hwy 57D) north-west to San Juan del Río. Then take Highway 120 past Tequisquiapan as far as the small cross-roads town of Ezequiel Montes. Turn left for about 11 kilometers, then right… and you’re there! Taking this route gives you glimpses of the Peña de Bernal from afar. Allow 2.0 to 2.5 hours for the drive. Surprising to me, Wikipedia says Devel’s Tower monolith in Wyoming stands 385m above the surrounding terrain and thus might be a competitor in the tallest monolith contest.